Is it a Skip or a Quack? Last Friday my Dad showed up unexpected and asked if I could do him a tiny bit of a favor. He asked if I could draw him a little sign for a charity event he would host the next day. “Only a couple of lines, just a little text, nothing major!” said my father. Now, he had this look on his face. And when he does, well, I cannot say no. 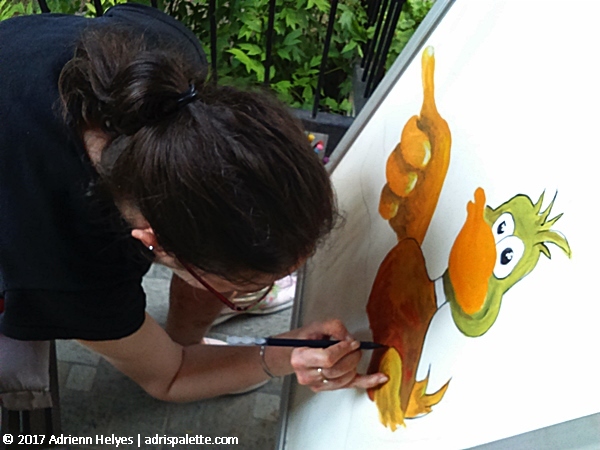 I thought it would be the perfect time to chill together over a lemonade, talk about ideas, and then paint a bit. You know, just catch up. 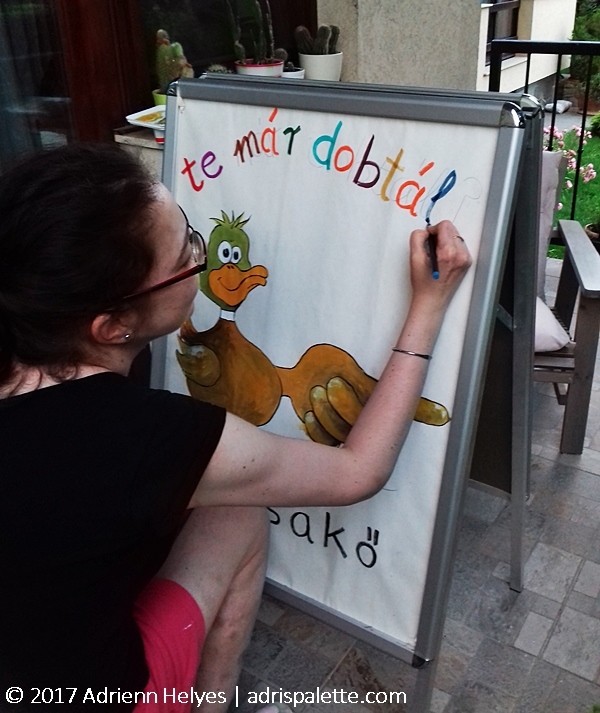 Well, it turned out he had other errands to run, so he brought over this ginormous easel thing to hold the paper, and left me to my own devices. Thanks Daddy! 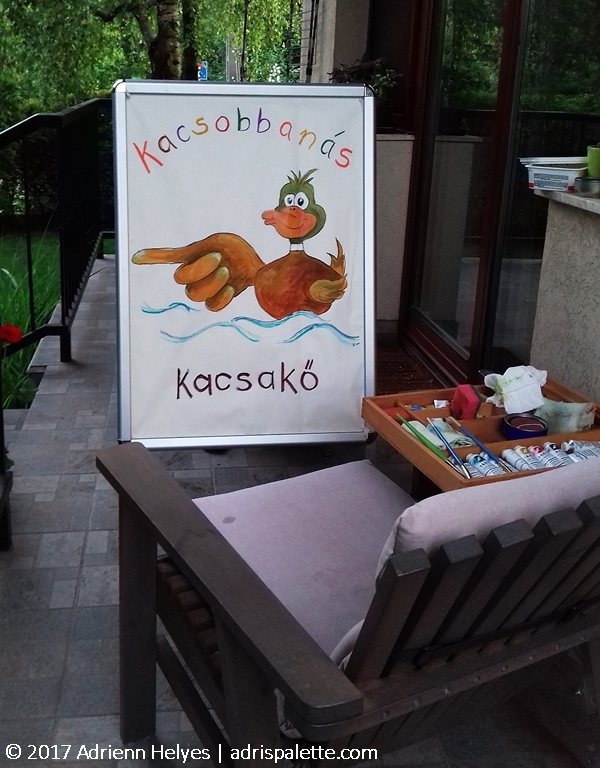 The little sign, poster he asked me to make was for the Annual Stone Skipping Contest in Szentendre (IV. Országos Szentendrei Kacsakődobó Verseny). The organizers collaborate with local artists, who donate the loveliest hand painted skipping stones as prizes to the winners. The sign was meant to guide the contestants to the event and to attract as many people to this fun little gathering as possible. As soon as my Dad mentioned a poster I immediately thought of a mallard. A wild duck, because stone skipping translated to Hungarian is to throw a duck stone. Also, because there is a brace of wild ducks usually paddling along the Danube at the very spot were the event was going to take place. 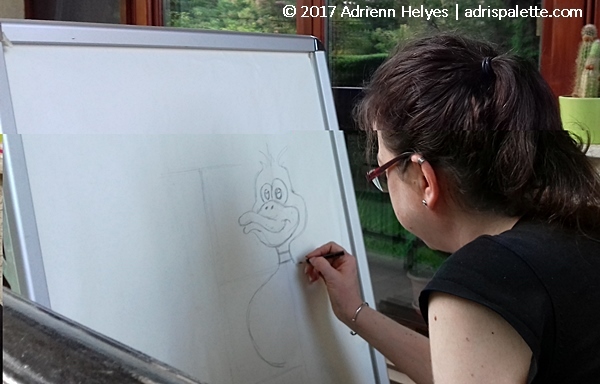 I started to draw the design free-handed on the easel itself to make sure I was going to see it exactly as the onlooker would. I figured, it’s not going to be that hard. Except I forgot that I’d have to freehand the mirror image on the back. 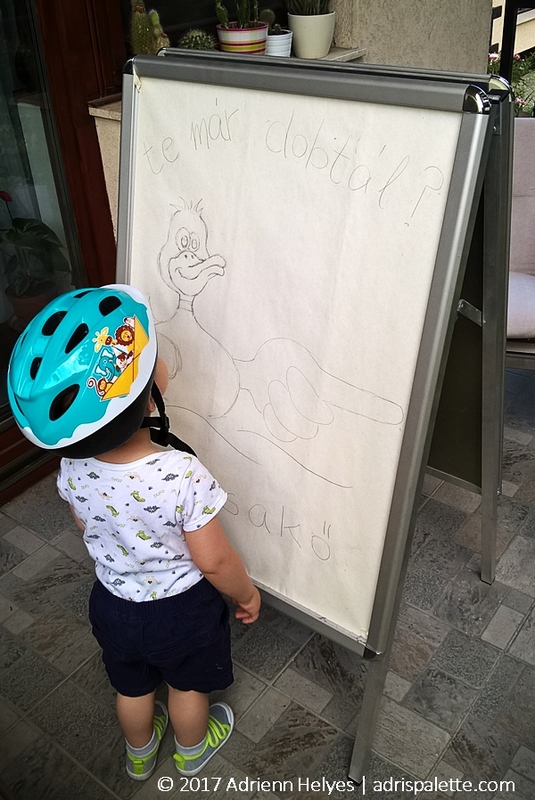 Once the design was finished I asked a true art-connoisseur, my little 2 year old nephew to give his opinion. He smiled his little pearly smile and nodded in agreement. I decided on something cartoony because I primarily wanted to highlight the fun aspect of the event. Also, I wanted to attract the kids. I figured, kids will drag along their parents, and more parents means a bigger crowd, so the event is going to be more successful. Sort of like a win-win situation! “Have you thrown already?” Side A.
I had lots of fun painting this poster. My Dad loved it. But I have to say, after a long work week this project took more energy out of me than expected. So it was not ideal before a long hiking trip due to take place the next day… but all in all I enjoyed it. I always like getting lost in a project, submerging myself to the fullest and noticing only after the fact that my fingers (and my pants) are all covered in paint. Fun times! P.s. Oh yeah, Dad, you owe me an ice cream. A scoop of lemon ice cream, to be more precise!